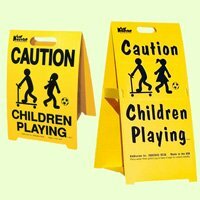 Our easily recognizable, stand up yellow plastic sign, lets driver’s know to be careful! Printed both sides on weather resistant material. Place sign at edge of driveway or yard for high visibility. Measures 20 inches high x 12 inches wide. Portable & lightweight with cut-out handles for easy carrying. It’s printed on both sides for added safety. Does the job, but tips over easily This sign is great as far as being able to be seen down our street. We live on a short street, in front of an alley in the city, and we have some speedy drivers on our short block. This seems to do the trick in telling people to slow down when they come out of or go into their garages. It does tip over even if there is no breeze, so we secure it with several large rocks. It does work, but it’s a little flimsy. I do like that it’s made in the USA and it CAN be seen from a little distance. The sign is bright and easy to see but it is light and easily blows over. If you want to use it you’ll have to secure it to the ground.